98% of the welfare recipients passed the mandatory drug tests and Floridians now have a $178M bill. That compares with roughly $32,200-$48,200 the state may save on one month's worth of rejected applicants. The savings assume that 20 to 30 people -- 2 percent of 1,000 to 1,500 tested -- fail the drug test every month. On average, a welfare recipient costs the state $134 in monthly benefits, which the rejected applicants won't get, saving the state $2,680-$3,350 per month. But since one failed test disqualifies an applicant for a full year's worth of benefits, the state could save $32,200-$48,200 annually on the applicants rejected in a single month. Net savings to the state -- $3,400 to $8,200 annually on one month's worth of rejected applicants. Over 12 months, the money saved on all rejected applicants would add up to $40,800-$98,400 for the cash assistance program that state analysts have predicted will cost $178 million this fiscal year. There was speculation that the legislation was a conflict of interest and an attempt by Governor Scott to personally profit from the state. Governor Scott was founder and co-owner of a company called Solantic. One of the many services that Solantic provides is drug-testing. In a CNN interview in June, Scott vigorously denied the conflict of interest and disputed reports that the company would still maintain ownership by his wife. He also defended his policy and cited his reasoning behind the legislation. Let's not sugarcoat this and call this political game out for what it really is. Governor Rick Scott had ample opportunity to improve Florida's fiscal house. It's simple mathematics and he obviously didn't get the memo or threw the memo in his trash bin. High unemployment means less people paying taxes in the state, so of course you take in less revenue. I am not buying the whole "let's save taxpayers money argument." This is the same Governor who turned down stimulus money to build high-speed rail in Florida, which would have created numerous jobs - hint, hint, tax revenue. Governor Scott has a problem with helping poor people and he sought to find a way to kick them off the rolls. There was no indication or the slightest form of proof, that welfare recipients in Florida were using their cash assistance to support a drug habit. Governor Scott perpetuated a stereotype and made an attempt prosper from discriminatory legislation. Should any state give mandatory drug tests prior to distributing benefits? Do you think welfare recipients are drug users? 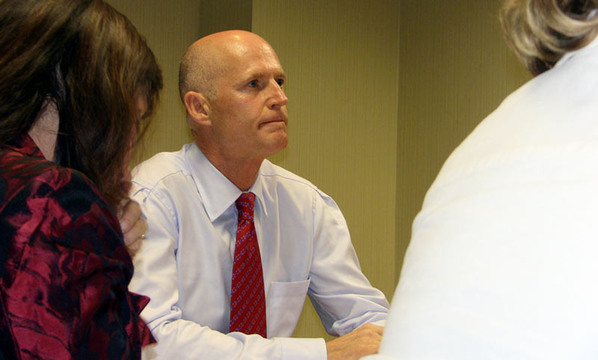 Does Governor Rick Scott really care about the fiscal conditions of Florida? Will this legislation result in any substantial savings to the State of Florida?